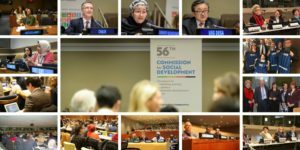 The Commission for Social Development fifty-sixth session, United Nations Department of Economic and Social Affairs Division for Social Policy and Development, was held at UN Headquarters, New York, January 29 2018 to February 7, 2018. Since the World Summit for Social Development in Copenhagen in 1995, the Commission for Social Development (CSocD) has been the key United Nations body in charge of the follow-up and implementation of the Copenhagen Declaration and Programme of Action. (v) Family issues, policies, and programmes. There were three High-Level Discussion Panels: Strategies for eradicating poverty to achieve sustainable development for all, a review of the Madrid Plan of Action on Aging, and innovation and interconnectivity for social development. 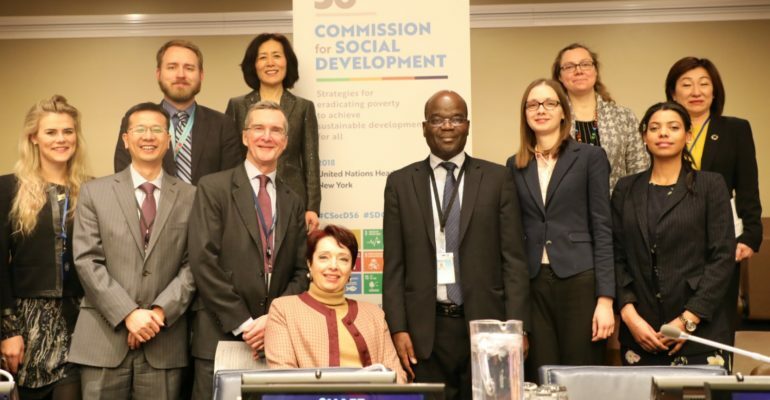 At the opening of session 56 of the Commission for Social Development (CSocD56) panelists highlighted the emerging issues for social development. They stressed the importance of social protection schemes needed to protect people living in economically, socially and/or environmentally vulnerable conditions. Social policies that can ensure appropriate and sustainable protection were agreed to be the key to lift people out of poverty and achieve the 2030 Agenda. Paying special attention to women’s empowerment was a successful strategy for social development in some countries. Mr. Nikulás Hannigan, Permanent Representative of Iceland to the United Nations and the Chair of the Commission for Social Development, said in his introductory speech that the role of the Commission is to establish a basic framework that promotes social development for all. He argued that tackling the challenges that have worsened inequalities within and among nations, as reported in the World Inequality Report 2018, would require effective social policies and strategies, including job creation, increased investments and tapping into the benefits reaped by globalisation. Ms. Amina J. Mohammed, UN Deputy Secretary-General, called upon the Commission to emphasise the acceleration of sustainable, inclusive and equitable economic growth that includes decent work for all and the empowerment of women, children and youth, indigenous peoples, older persons, persons with disabilities, migrants, refugees and internally displaced persons. She encouraged countries to “be creative and to prioritise accelerating the action of the 2030 Agenda” and to provide social protection policies, including safety nets, as the current absence of such mechanisms in many countries is “unacceptable”. Poverty eradication is a stand‑alone goal as well as an overarching theme throughout the 2030 Agenda, which highlights the barriers that people living in poverty face. Effective social policies and strategies, including job creation, increased investments and tapping into the benefits reaped by globalisation would be necessary to tackle these challenges, added Liu Zhenmin, Secretary‑General for Economic and Social Affairs. Additionally, the multidimensional nature of related challenges and the focus on access to quality work, robust social protection and political inclusion were key points from the Youth delegate and president of the European Union Youth Forum, Luis Alvarado Martinez, while for Mr. Daniel Perell, Chair of the NGO Committee for Social Development, social protection schemes must take into consideration local communities, their resources, and aspirations. During country interventions at the opening session, some countries, such as Costa Rica and the Southeast Asian Nations attributed their progress on social development to the promotion of science and technology, inclusive communities, women’s economic empowerment, youth development and the rights of women and children. Other countries such as Portugal, Egypt, and Ghana mentioned their efforts to pay special attention to women within their planning and programmes by tackling violence against women, increasing women’s political participation and boosting employment opportunities. 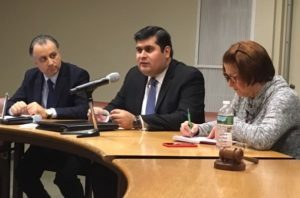 On January 31, the High-Level Disability Panel was the last panel to convene and I prepared a short statement with two questions. Due to time constraints, I did not have the opportunity to speak. I attended the first three high-level panels and side events and all spoke of the progress and current strategies to meet the SDG 2030 goals. Until this last panel, little was said on disability. Now, however, all panelists and guest speakers focused on their nation’s ability to collect disaggregated data and all agreed that more is needed to reach satisfactory resolutions. Panelist Ms. Mary Crock strongly voiced that more attention should be given to “international clarification of disabilities with an understanding of impairment and context”. Those with mental health issues, invisible disabilities, neurological disorders and conditions and debilitating diseases must have better outreach programmes and services in cities and particularly rural areas. Providing accessible transportation, schools, housing, shops and financial and medical facilities will give the disabled independence and self-respect. Interconnectivity in the home can allow those with limited mobility to be self-educated and earn an income online. Mothers will be able to support themselves and children. the specific concerns and experiences of older women and men and the need for a gender perspective. The findings of the MIPAA review and appraisal in the report of the Secretary-General (http://undocs.org/E/CN.5/2018/4) will also provide a backdrop for the discussions during the upcoming session of the Open-ended Working Group on Ageing that will take place from 23-26 July 2018 to further discuss the elaboration of a convention to promote and protect the rights of older persons. This panel focused on the use of technology as a tool for advancing social progress and achieving the 2030 Agenda and Sustainable Development Goals. The Internet is a powerful tool for accessing information including political, civic, economic, world news, health and knowledge platforms, but in many communities, there is information poverty. More than 4 billion people do not have access to the Internet, and the gender gap is growing. In poor communities and developing countries of Africa, Latin America, and Asia, women are 50% less likely to have access to the Internet. Cost and access are major reasons for the gaps, but also lack of education in how to access and use technology. The negative aspects of technology include fake news, sexual harassment of women and cyberbullying. Countries must take steps to provide access for all, training and safeguards to protect women online. Best practices for increasing interconnectivity were discussed such as developing libraries and community centers where the community can learn how to use technology and access the Internet. Mobile labs can be used for rural access. 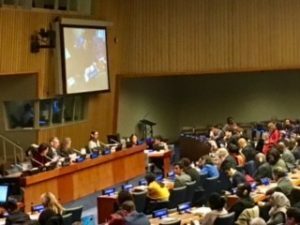 Argentina has a number of NGO and private programmes to improve women’s digital inclusion, including creating a national plan for a better infrastructure, modernising public services, providing training programmes and encouraging Girls in Technology programmes to provide STEM education for girls. The Commission on Social Development provided the opportunity for civil society to submit questions to the four panels in advance. I submitted one question each for the first two panels on January 29 and 30 and both questions were accepted. A panelist from Germany responded that his country has been working on integrating the large number of migrants who had arrived in the last several years and that Germany would be involved in negotiations on the Global Compact on Migration. “The women speakers have each mentioned the need for more equality for girls and women and have highlighted some specific programmes. But we know that historically women have been left behind in technology and it’s still a man’s world. Professor Valdivia stated that advances in technology exacerbate inequalities, and if, as he says, business models will be used, they will surely discriminate against women. So my question is directed to the men on the panel. Women need access but they need much more. What actions can promote their full participation in the development and operation of interconnected networks and their participation as leaders, as technology and innovation march forward? I did not receive any satisfactory answers to this question”. Did you ever wonder how these commissions, forums and other multi-day meetings actually happen? 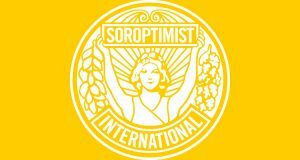 Soroptimist International New York representative Bette Levy explains all that goes on behind the scenes to arrange a recent meeting at the United Nations headquarters, the 56th Commission for Social Development in PART TWO OF CSocD HERE. 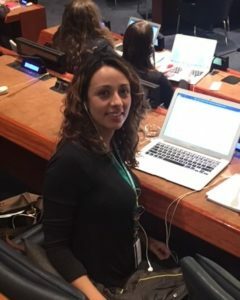 Visit the Commission on Social Development, 2018 CSocD at un.org to learn about the organisation of the work, agendas, papers, and videos of the sessions. If you are interested in working on these issues, visit http://ngosocdev.org to learn more about Civil Societies participation.